Performed at the end or the beginning of a rope routine, this crowd pleaser is a great stage effect for audiences great or small. The magician declares he needs a length of rope for his next trick and searches for one under a table or inside his jacket. He comes up with a three foot length, which he holds in his left hand. Deciding it is not long enough to suit his needs; he reaches up with his left hand and pulls the rope, which begins to lengthen in full view of the audience. Twice more the magician stretches the rope, ending up with a length triple the size he began with. The rope was always nine feet long; it just appeared to be shorter in the beginning. A nine foot length of rope and a dinner jacket. 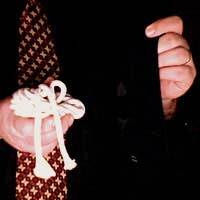 Coil the rope from the middle of its length and then put it in a dinner jacket pocket. Feed the two ends of the rope up the jacket sleeve of the left hand where they can be quickly grabbed by the right fingers. The Stretching Rope trick is a fantastic way to start a rope routine - while the magician may not need nine feet of rope for any single rope trick beyond this one, he can cut the appropriate lengths from this starter rope as he goes. When the magician announces he needs rope to perform his next illusion, he should then duck under a table to search, or perhaps turn slightly to the side as he looks inside his jacket. Gripping the ends of the rope up his sleeve, the magician pulls the lower end out about eight inches and the other end about two feet. Held properly, these two lengths should look like one rope when held in the left fist. The magician takes the longer end in the right hand and holds it out to its “full length” and examines the size. “This won’t do” he says, announcing he needs a longer rope. Reaching up with the left hand, the magician grabs the rope by the base of the right hand and then pulls downward. The body should be turned just enough so that the back of the left hand and arm are toward the audience. As he pulls down and slightly away from the body, the rope will feed itself out of the left sleeve, up through the left hand. It will seem as if the magician is stretching the rope itself. Again he examines the rope and says it is not quite long enough. Reaching up with the left hand, the magician releases the right hand grip and takes another grip near the left hand. Again the magician pulls down and out, and the rope stretches. Once more should pull the rest of the rope out from the jacket and sleeve and now the magician is satisfied with the length of rope. Not only should the actual trick be practiced to make the stretching of the rope believable, but the start of the trick should be rehearsed as well. How will the magician get to the rope? How will he produce the first length?